All music classes held 9-12 am at the Cowan Elementary School. Parents with young children, check out Kids on The Creek. Beginning Banjo (Montana Hobbs) is for folks with no previous experience playing a string instrument. Students will learn the basic clawhammer strum and chords for accompanying simple old time tunes. 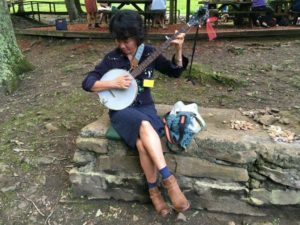 Early Intermediate Banjo (Carla Gover) is for banjo students who have completed a beginner class, a Pick & Bow class and most folks who have been playing a couple of years. Carla will focus on solid right hand technique while you cover banjo tunes that are easy and fun to play. Intermediate Banjo (Kevin Howard) is for banjo students who can play a handful of tunes and are comfortable with the clawhammer strum. Kevin will explore southeast Kentucky banjo styles and alternate tunings, while expanding your repertoire of favorite old time banjo tunes and songs. Intermediate/Advanced Banjo: Two-Finger Style (John Haywood) is for banjo players who want to expand their right hand technique. John will focus on the two-finger tunes of Morgan and Lee Sexton, George Gibson and Roscoe Holcomb. Because this class introduces an alternate style of picking, intermediate and advanced students should feel equally comfortable. Beginning Fiddle (Meghan Bryant is for folks with no prior experience. Meghan will start with the basics – holding the instrument and bow technique to produce the sound your want, while learning some favorite easy tunes. She will also give you the tools to learn more tunes on your own. 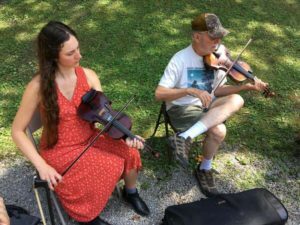 Advanced Beginning Fiddle (Megan Gregory) is for students who have completed a beginner class or who have taken fiddle in Pick & Bow and most fiddlers who have played less than one year. Megan will share tips to make playing easier and more fun while teaching some favorite Kentucky tunes. Early Intermediate Fiddle (Erynn Marshall) is for folks who have completed a beginner class and most fiddlers who have been playing at least two years. This class will build your repertoire of tunes that are easy and fun to play. Erynn will also introduce playing the fiddle in alternate tunings for an authentic Kentucky sound. Intermediate Fiddle: Cross Tuning (John Harrod) is for fiddlers who can play common old time tunes and are ready to expand their repertoire. If you have yet to explore the deep trove of Kentucky tunes which depend on alternate tunings for their color and authenticity, this class is for you. John will cover tunes from the greats: Bill Stepp, Luther Strong, Manon Campbell, J. P. Fraley, Cylde Davenport and Art Stamper. Advanced Fiddle: Finding Your Own Voice in Traditional Fiddling (Tatiana Hargreaves) will closely examine the unique fiddle styles of John Dykes, Cuje Bertram, Manco Sneed, John Lusk, and Tommy Jarrell. What musical and cultural influences led them to their sound? What influences make our playing different today? We will explore these questions, experiment with melodic and rhythmic variations and by the end of the week have a better idea of ourselves and our fiddling. Advanced Fiddle (Jimmy McCown) is for fiddlers who are comfortable playing common tunes at dance speed. Jimmy will share tunes from some of his favorite east Kentucky fiddlers including Ed Haley, Art Stamper, Paul David Smith and Kenny Baker. Beginning Guitar (Mitchella Phipps) is for folks with no prior experience. Mitchella will cover the essentials, such as holding the pick, the basic strum, chords for common old time tunes and backup for a few simple songs. Intermediate Guitar (Russell Wright) is for guitar players who know a few basic chords. Russell will cover essential chord progressions, walk-ups, right hand technique and the skills you need to arrange guitar back up on your own. Advanced Guitar (Don Rogers) is for guitarists who are comfortable backing up common tunes. Don will cover rhythm, back up runs, traditional Kentucky fiddle tune melodies for guitar, accompaniment, and the basics of finger picking. Mountain Dulcimer (Sarah Kate Morgan) Come learn some unique and fun old-time tunes that are from the eastern mountains of Kentucky. We’ll be discussing the mountain dulcimer’s role in old time music and how to add rhythmic drive and variation to these tunes. Be ready to explore new tunings. Sarah will teach by ear, rather than tab, which will enable you to learn and arrange tunes on your own. 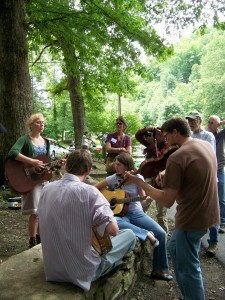 Old Time String Band (Linda Jean Stokley) is for intermediate and advanced level players of any string instrument and singers of any range or age. 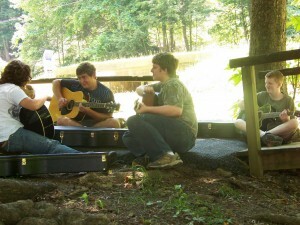 Students will work in small groups to polish tunes and songs for performance. You’ll cover a wide range of pieces, from mountain fiddle tunes to songs with instrumental accompaniment, while building the confidence you need to work well in a band and take the stage yourself. Songs & Ballads (Rich Kirby) will center on the many aspects of the mountain singing tradition— gospel, ballads, Carter Family, mining songs, and more. We’ll spend time listening to each other and to recordings of great mountain singers like Hazel Dickens, Addie Graham, Tom Ashley, Claude Ely … but the heart of the class will be singing together. Bring songs to share. Instruments are welcome but we will be doing a lot of songs unaccompanied. Class size for all instruments is limited to 10. Please register as early as possible to be sure you get the class you want. If interested, you can indicate a second class choice on the 2019 Registration Form in case your first choice isn’t available. Students registering for the string band class should indicate what instrument they will be playing. Unsure of what level you should take? Sign up for the one that you think would best fit, and know that once you get here, you can try the class out on Monday and make sure it works– if not, we can find the class that suits your level! Tuition for 2018 classes is $200 for Kentucky residents and $300 for out-of-state students. Tuition for Kids on the Creek is $150. Opportunities for youth scholarships and workstudy are available.